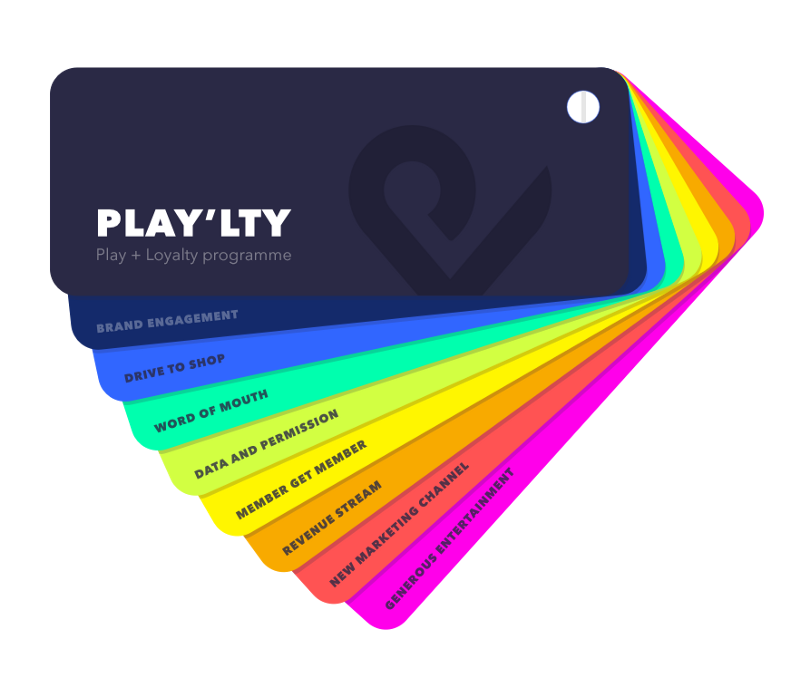 Play’lty — New Paradigm Within Loyalty Programmes – Let's play! It is more difficult than ever to break through the clutter, connect with consumers and keep them loyal. Brands and retailers strive to engage their customers and bring more value by using numerous tools and the most common is loyalty programmes. 66% of Europeans belong to at least one loyalty programme (Nielsen, 2016). The highest percentages of loyalty club members are 94% in Finland and 90% in the UK. However, many brands fail to maximize the benefits from their programmes as they do not meet consumers’ needs and wants. For instance, members complain about not being able to collect points altogether from the store and its online shop, lack of personalization and a poor choice of rewards. Flexibility. 75% of consumers wish to collect points from purchases in stores, on a website or on a mobile device and choose among different redemption options. Personalization. 72% of consumers want to have personalized experience of offers and promotions. Status. 71% of consumers express willingness to earn bonuses for doing some specified activity. Technology. Around 40% of consumers wish to have a loyalty scheme integrated across all digital channels. Creating loyalty is not only a matter of points and offers, but also a matter of having a strong brand. But most of the loyalty programmes available only focus on the first part and are usually disconnected from brand building activities even though they are closely related. What if we could create a bigger ecosystem where we combine it all and where storytelling, brand experiences, rewards and loyalty points go hand in hand? What if we could introduce a new paradigm within loyalty that will change the game? Well we can and it’s called play’lty. In its essence play’lty is about applying some of the same dynamics that make a good friendship to a consumer / brand relationship. It’s about having fun together. Give and take, being generous and helpful. All in all, it applies the feeling of being entertained and getting something of a great value in return with somebody you like. 1. Gamified content provides compelling and unique experience, allowing the members to earn points through branded content, which in turn increases the brand appeal. 2. A game supports the brand’s coherent universe and lets a brand communicate messages more effectively, since people are actually interacting with it. 3. The level of brand engagement is massive. We talk hours here. 4. Rewards is what drives people to join and stay in a loyalty scheme, and it’s the main and core motivator in games. The difference is that a game makes collecting points entertaining as it injects fun into otherwise monotonous point collection that you’ll find in usual loyalty programmes from airlines, retailers etc. 5. Playsumers (consumers who like to play games) can see and follow their status on a leaderboard and compete against their friends, which makes it a perfect tool for recruiting new members. 6. More data and email permissions are granted and can slowly be enhanced since trading of information is possible due to the in-game point mechanics. That leads to a more efficient targeting as gaming data and data collected elsewhere can be merged and lead into location based offers. 7. Customers might actually pay for future updatesand maintenance, even though a game is launched free to play. But 3–4% of the players actually spend money on in-game products like new lives, boosters etc. They do it because they feel entertained. 8. A network of diverse voucher partners allows consumers to redeem points in a preferred store. Research has shown that consumers, who also get to choose rewards outside of brand’s core inventory, are more engaged in the long term. 9. Works as a bridge between different marketing channels and enables storytelling that can feedback to other media as well. 10. Word of mouth: fun stuff tends to make people talk about it and the absolute best driver in making people do something is when they get a recommendation from friends and family. There is no doubt that a play’lty programme makes brands stand out from competitors and it is a game changer in this field. No matter if it’s built as a stand-alone solution or an add-on to the existing loyalty programme. It will definitely work, as it has done for a Danish hypermarket Bilka (See the case study).